There are many misconceptions about this common ailment affecting many individuals in the community. People often use the term loosely to describe generalized hand, wrist and forearm pain that may be related to other diagnosis. On the other end of the spectrum, many people live with symptoms of carpal tunnel syndrome and don't realize that there are simple solutions for their condition. 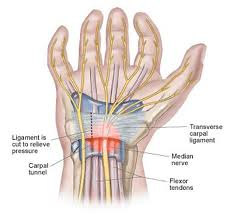 The most common symptoms of carpal tunnel syndrome are numbness and tingling in the hands and fingers. Patients often complain that their hands “fall asleep”. There symptoms are usually worse at nighttime, often awaking them from their sleep. They find themselves having to shake their hands out to relieve their symptoms. The numbness and tingling are often accompanied by crampy hand and forearm pain. In severe cases, patients complain of weakness in their hands with loss of fine motor function of the fingers. Once the diagnosis is confirmed, we start with a conservative approach. Conservative treatment consists of wrist splinting for 4-6 weeks. The wrist splints are removable and usually are worn at night time only, depending on the severity of the patient's symptoms. The next step in treatment , if patients fail conservative management, is surgical treatment for their carpal tunnel syndrome. Surgery is minimally invasive, performed at an outpatient surgery center, often with return to work and normal activities within a week. Injection of the carpal tunnel with a steroid solution, for temporary relief of symptoms, may be an option for the right candidates.